The building is located in the Northwest administrative district, at the TSSCA sport complex territory, adjacent to Leningradsky Prospect. The Plaza consists of two volumes: a stylobate two-floor piece along Leningradsky Prospect and a triangular nine-floor tower above it. 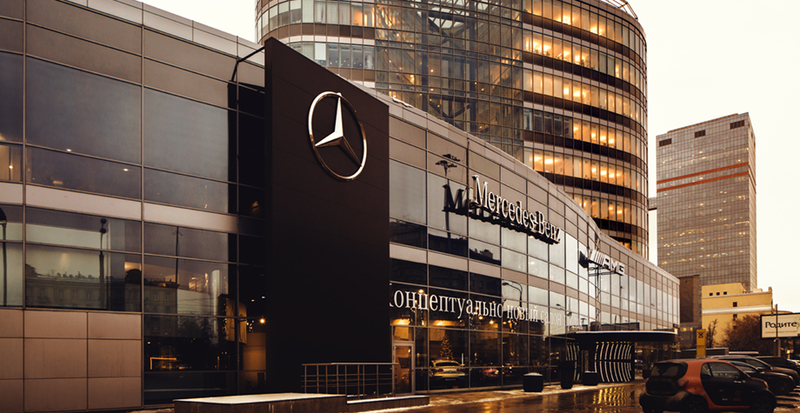 The first two floors house a «Mersedes-Benz» auto exhibition space, a restaurant and offices. The show entrance is gained from the Leningradsky Prospect side. The main entrance to offices and all other entrances and approaches to auxiliary premises are from the TSSCA stadium side, thus providing for integration of the auto show exposition space—which faces Leningradsky Prospect—and giving it a more austere and attractive facade. Glassy walls allow one to see dual-light internal exposition spaces and to additionally serve as the automotive exhibition storefront fenestration. The tower is occupied by offices. Office premises surround an internal atrium, which is connected with the show space and unites all the elements of the building. An underground parking lot for 133 cars is approached from the TSSCA side. Facades are decorated in keeping with the corporate style of DaimlerChrysler. IKS Hochtief-Frankfurt interiors follow the same principle. Width of the area and the distance of one of its sides from the windows — the main problem for the design of the office.